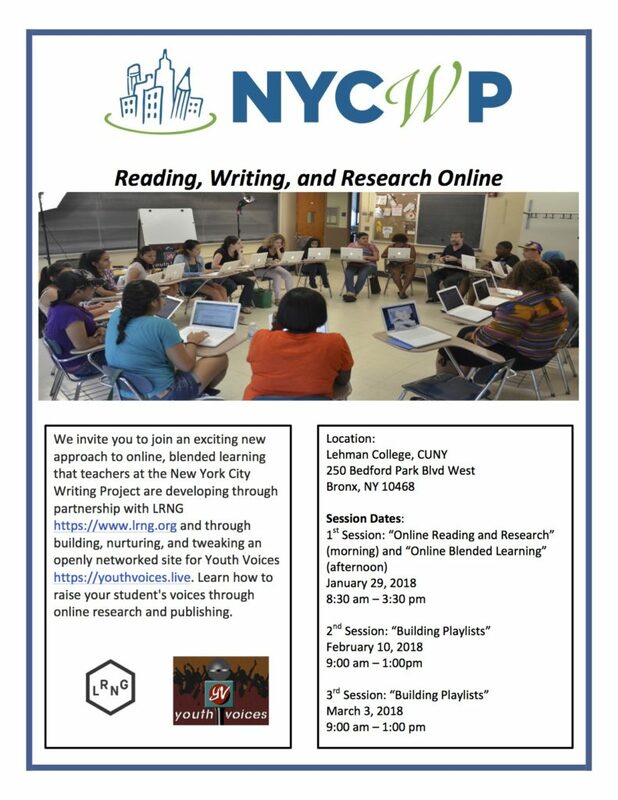 On January 29, 2018, The New York City Writing Project will host the first of a three-part workshop series “Reading, Writing, and Research Online” at Lehman College. This workshop series will provide strategies for the teaching of writing with digital media over three sessions. The first two parts of the workshop series will be held on January 29 in the morning and afternoon. The third installment of the series will be held over two sessions: February 10 and March 3. Each session has $60 registration fee and provides CTLE-credit. If your principal would like to pay for your registration, please contact the NYCWP coordinator, Emmy Williamson: emmy@nycwritingproject.org. The first session of this series “Online Reading and Research” begins with an interest of your own, we will guide you through a process that you can do with your students the next day. We begin by making comments to young writers on Youth Voices from around the country who share our areas of inquiry. Then we use our own questions to find relevant and useful information, annotate texts online, and include quotes from these sources in our first blog posts on Youth Voices. At the end of the first 90 minutes you will have a brainstormed list of questions in Google Docs, and on Youth Voices you will have a comment that follows a guide we’ll provide and your own post that includes a quote or two from an online article. You will submit this work to earn your first open, digital badge. Your blended learning experience will take you from writing questions to portfolio assessment in 90 minutes. Next, we’ll unpack this experience through a careful discussion of how you might include this online writing process in your classroom. And finally, we will read, annotate, and discuss documents that describe Connected Learning, the theory and the research behind the Youth Voices platform and the online curriculum that we have been designing and nurturing at the New York City Writing Project for the past 15 years. In the aftermath of the Unite the Right rally and the counter protests in Charlottesville, Virginia in August 2017, schools were about to open in Oakland, California. Recognizing the historic importance of this moment, a teacher at Fremont High School thought that an inquiry into Charlottesville would be an excellent way to invite her new ninth graders to raise their voices about issues that matter to each of them on Youth Voices. She gathered resources, selected several photographs for point-of-view writing, created a template that made concrete the criteria for a capstone essay written in the form of a Letter to America’s Leaders, and enrolled her students on Youth Voices so that they would have a place both to publish and have conversations about their letters. We gathered this teacher’s resources and curriculum into an LRNG playlist. After we’ve completed the four online experiences (or XP’s, as they are called) in the Charlottesville playlist, we will use our experiences as learners to inform a conversation about this new form of blended, online curriculum. We’ll ask you to go further, looking at more of the playlists that we’ve designed and organized on Youth Voices, and then to even further. we’ll show you how students can choose playlists from a national collection of playlists on LRNG. You will leave with many ideas and online resources that you can use to teach a blended, online curriculum, beginning tomorrow.